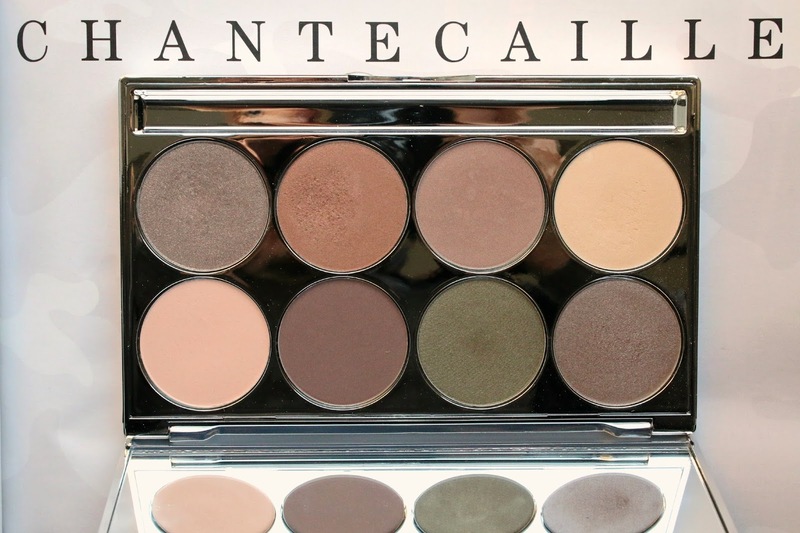 I've said time and time again that Chantecaille eye shadows are some of my favorite shadows. They never have too much or too little pigment and blend beautifully. And so many of the colors are perfect for daily use that I find myself reaching for them regularly. There are a good selection of both matte and shimmer shades, though I will say the shimmer is never too glittery. It's a refined shimmer that is perfect for any occasion day or night and any age. Often older women shy away from shimmer because it can look unflattering and make lids look crepe-y or very textured. However, Chantecaille shadows are soft enough that the shimmer blends seamlessly on the skin and never emphasizes imperfections. They have the option to let you create your own palette with 3 or 8 shades (both eye shadow and blush), and I have both a 3 and 8 sized palette but only have the 8 sized palette filled at this time. You can buy the eye shadows individually but you will need to buy a case to house the shadow, so it's a better option to simply buy the palette. I've accumulated quite a few great neutral shades that work well together or separately. I like to have a selection of shades which I can just throw in my bag if need be that will create any look I may need. I have a good mixture of both matte and shimmer shades that are in neutral brown, plum, green and beige tones. 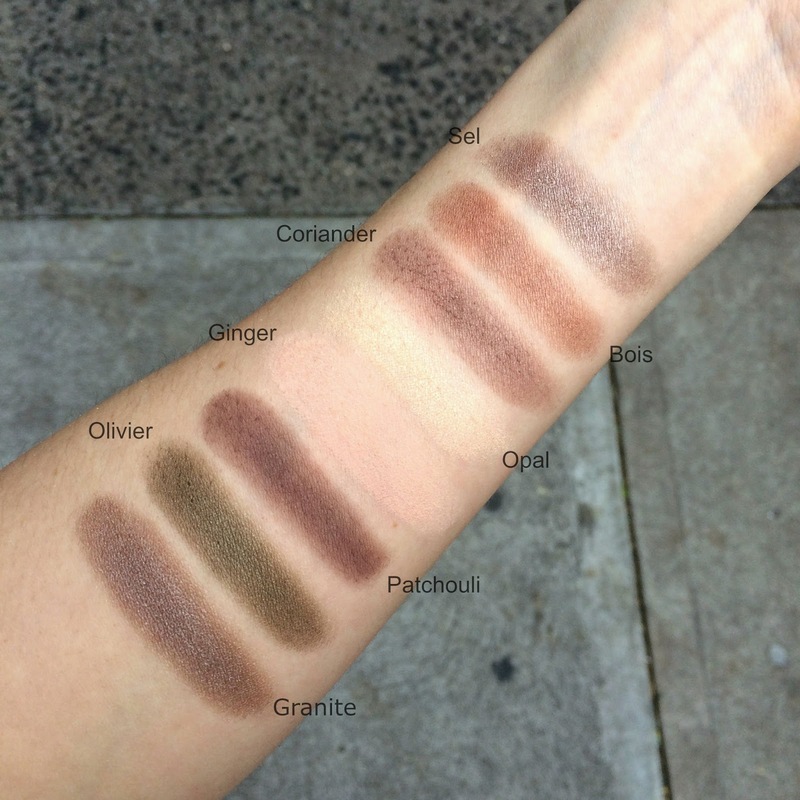 Below are swatches of the entire palette I have created. The top row swatches are on the left side of my arm and the bottom row swatches are towards the right side of my arm. 1. Granite -This is the a beautiful brownish-gray shade that I love to wear in my crease. When I pair this with Opal, it creates a perfect eye look for every day. 2. Olivier - I'm making a concentrated effort to seek out other colors that are suitable for the office and every day but are not part of the brown family. This olive shade is a great alternative and looks beautiful as a liner, lid or crease color. 3. Patchouli - One of my favorite shades to wear in my crease is a deep plum, and this is exactly the color I've been looking for. It creates a smokey eye in two seconds when added to the corner of my crease and looks great with almost any lid color. 4. Ginger - In the summer, I love wearing this matte peach shade on the lid with bronzer and a coral lip. In the winter, it looks lovely paired with a natural flushed cheek (love this By Terry blush shade), a few coats of mascara (this is my current favorite) and a bold red lip (love this shade). 5. Opal - This is by far one of my favorite lid color of all time. When built up, it can give a bold opaque look, but can also be dusted on for a sheer wash of color. Everyone needs one of these lid color shades that they can pull out any time to build an entire eye look around. 6. Coriander - Somewhat similar in tone to Patchouli, this is a bit lighter and not as pigmented which makes it great for an everyday crease color. I can apply this right above my lid through the crease and it gives my look some depth and dimension with creating a look that is too dark. 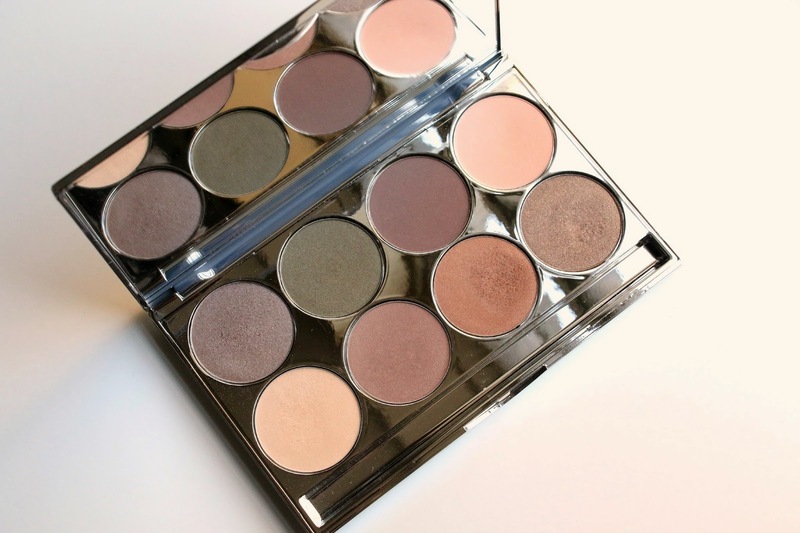 Every makeup collection needs one of these crease colors that serve as the backbone of creating any eye look. 7. Bois - I call this my bronzed goddess shade, because it the perfect golden brown for my lids. It doesn't skew too orange, too yellow or too brown and is an easy wash of color that looks good worn alone or paired with a darker brown. 8. Sel - This shade is very similar to Granite, but has a bit more silver in it so I prefer this on the lid alone as a subtle, daytime smokey eye. Chantecaille shadows are available at Space NK, Nordstrom, Bergdorf Goodman and Neiman Marcus.